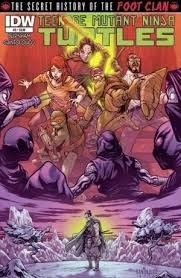 For this set of reviews, I didn’t deviate much from last month; I just swapped out one of the Teenage Mutant Ninja Turtles: The Secret History of the Foot Clan issues for a plain old issue of Teenage Mutant Ninja Turtles. 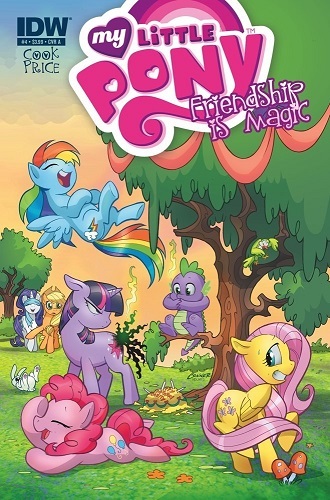 If you were to chart the highs and lows of this first arc of My Little Pony: Friendship is Magic, the trajectory would look like a single beat of a normal heart on one of those heart monitors. Issue #1 would be right down the middle, nothing too special, nothing too bad, then issue #2 spiking to grand heights of funny animal comics, before an equal spike in the opposite direction following issue #3’s needlessly dark depths. Finally, this issue comes and, well, it’s nothing too special, nor too bad. Twilight Sparkle and friends finally reach the bad guy, after a few bizarre horror movie references (parodies played for laughs, rather than genuinely horrific like last issue). Twilight and Queen Chrysalis duel, and I have to say it was a bit silly, but not in a purposeful way. Even the highlight is the same as the first issue’s; the best joke is, once again, Scootaloo making fun of Queen Chrysalis. “I’mma getchoo Twilight!” A bit of apology, here. Seems like they were doing something with the stupid Pinkie Pie fursuit after all. It keeps popping up in this issue, and eventually, Twilight finds a use for it. Still not that funny, though. Like the first issue, Katie Cook does a quick two pager story at the end of the issue, this time featuring Spike and Princess Celestia fighting giant mutant cockatrices in Canterlot, thus explaining their absence. Breathlessly silly, this time on purpose. After the last issue, the turtles find themselves, suddenly and without warning, in the middle of a pitched lasergun battle somewhere in the middle of Dimension X. I don’t know, if the Neutrinos can find a way to teleport between dimensions, you’d think they could find a way to teleport to somewhere they are less likely to get shot in the face. I’m just saying. But it’s all just a reason to show the turtles fighting aliens with laserguns, and, no, there really doesn’t need to be an excuse for that. The first half of this issue is pretty darn exciting, even if it doesn’t always make perfect narrative sense. Eventually, Michelangelo rescues a space princess from a badly timed kidnapping attempt. So we’ve got a royal kidnapping and a robot rescue mission going on at the same time in the middle of a pitched battle. Who is planning this intergalactic war? Eventually, things calm down and the turtles finally learn that the Chet guy April works with is actually a robot from Dimension X, and also there is an alien brain named Krang who is a bad guy (but, then, when are alien brains from Dimension X ever good guys? ), details that the reader has known for quite a few issues now. Also, in an aside, Splinter breaks a broom, and we get to see more of April the spy. Don’t think about this one too hard, folks. It’s a comic book. Ben Bates is the hero of the creative side of this issue; his cartoony style makes an asset out of the absurdity, rather than a flaw. This issue is bookended by Oroku Saki’s story in the past; fewer pages are devoted to it than in previous issues, but they still tell vital parts of his story. While the main book is devoted to cartoony soft sci-fi, this mini-series takes on a harder edged look at supernatural mysticism, though that first issue reveal points to the connection between these two seemingly very different elements. For furries, the highlight of this book will be the transformation of baddy Alopex, the mutant arctic fox vixen, into a credible threat. I mentioned in earlier reviews of the main storyline that Alopex’s most distinguishing feature (other than being a giant bipedal fox) was her amazing ability to get punched in the face. In this issue, she still takes her fair share of knocks, but this time, she doesn’t stay down. She actually becomes a bit scary; it’s pretty awesome. Pretty awesome is the phrase that would best describe this whole mini-series. Mateos Santolouco will be taking over art duties for the main book soon, and even though I will actually miss Ben Bates’s take on the turtles, I’m looking forward to the new look based on what I’m seeing here. 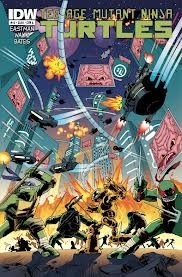 Not too long ago, I was perpetually complaining about the artwork on the TMNT books; now it’s a highlight of the series.